I'm from the amazing Moldova! Where and what do/did you study at University? 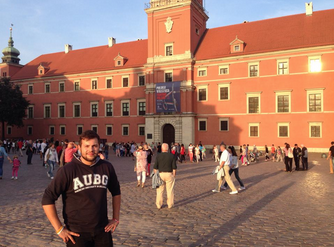 I am currently pursuing my Bachelors Degree in Business Administration at the American University in Bulgaria. I got introduced to Google as a potential employer when I was a freshman at university. At that point, I realized that working at Google would be a DREAM job. In the summer of 2013 I received an email with the call for applications for Google AdCamp EMEA, so I decided to give it a shot and amazingly, I got in. Through AdCamp, I got the chance to take a deep dive into Google’s culture and explore Google’s career opportunities, while spending four days at Google Dublin (EU HQ). What type of internship are you doing? 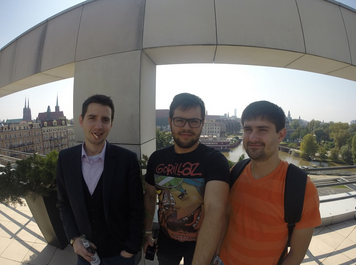 I did a Business Associate Internship at the Google Wroclaw office in Poland. Half of my time was spent working with Small and Medium Business (SMB) Services for the Russian Market and the other half was spent working on my project: AdWords Policies optimization. What does your workday look like? Typically I would use the morning to do all of my SMB Services tasks and after lunch, I would mostly work on my project, which involved analyzing data, getting in touch with Googlers in other offices and developing supporting materials for my findings. Besides working on the core job related to SMB Services for the Russian Market, I completed an analysis of all of the major issues related to AdWords Policies in this Market. Based on my research, I was able to provide Google employees solutions and implementations related to providing a better user experience when it came to dealing with AdWords policies. Additionally, I managed to host two Webinars related to AdWords for the Russian speaking market. 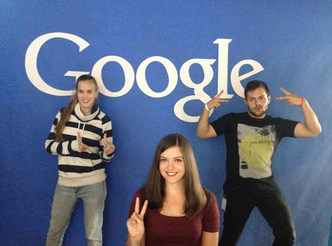 Finally, I delivered three trainings for Nooglers (New Googlers) and Full-time employees of the Russian SMB Services Team. At Google you have an opportunity to collaborate with people from many different backgrounds. What moment stood out to you, where diversity in the team made for better and more innovative work? I was able to work with Googlers who had deep knowledge on the subjects related to my core work and received support from the people around me, on any questions that arose during my project. Additionally, the team diversity made every working day unique, starting from people playing on the guitar when they wanted to relax and finishing with amazing travel stories from Mount Kilimanjaro. We all know Googlers and interns love the food and the other perks. Outside of some of the well-known perks, what’s your favorite part about working at Google? The perk that I loved the most was the ability to work from any Google office. This option gave me the chance to travel around the region and explore some amazing cities like Berlin, Prague and Warsaw. “Being Googley” is about being open to everyday awesomeness and collaboration. It’s about having a unique hobby and sharing it with other people. It's also about giving support whenever needed and loving all of the things that you do. What do you like most about your Google office and its locations? I simply fell in love with Wroclaw. Google was wise to place its office there. It is a super lively and a large beautiful city, while still providing you with a sense of coziness. It had anything a person needed for his or her free time, like: kayaking, aqua park, football, great pubs and restaurants, beautiful architecture and the friendliest people. What will you do after your internship? I’m back at university completing my senior year. Soon, I will start a part-time internship at a Marketing company in Bulgaria. I'll also be pursuing my hobby in theatrical acting. What are your top 2 tips to potential student applicants? First, be honest in your application. Everything you write should express who you actually are. Secondly, be active during your student years by participating with different clubs and activities, and develop yourself through an interesting hobby. Interested in joining the Google team? Check out our student positions today and apply! EEA work authorization is required for roles supporting EEA markets. Our interns have the opportunity to work on some of Google’s most cutting edge and innovative projects - not only in engineering, but across sales and other business functions, bringing a fresh perspective to the work done at Google. To show you just how much of an impact interns make and to highlight their unique experiences, we’re bringing you a special blog series: Google Intern Insights. Make sure to look out for the different interns being featured on the blog throughout the fall!